After a cold and dreary winter, the new spring sports and outerwear arrivals at Windsor Crossing have us energized and ready to go outside! 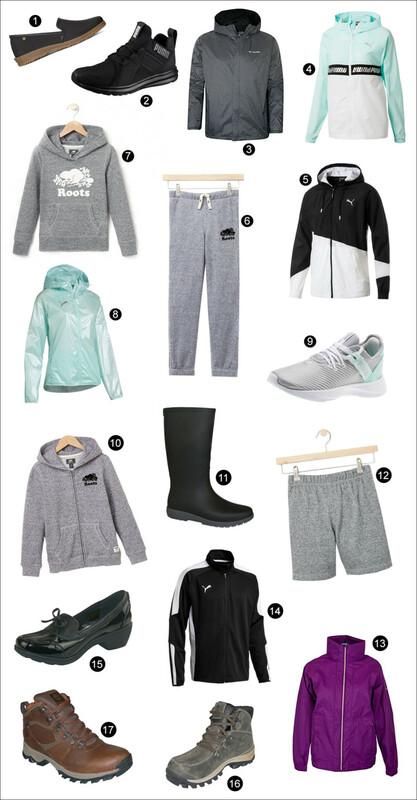 These key items will have you spring ready whether you’re taking a leisurely walk along the riverfront, running down Ganatchio Trail or hiking through Ojibway Park! Windbreakers – These light and versatile jackets from Puma are great for every day protection in the changing spring weather. Wear with a tank or add some layers underneath depending on the temperature. Runners can also easily coordinate them with their selection of matching running shoes. Rain Jackets – Columbia Sportswear is based in the Pacific Northwest of the US so they know rain better than anyone! Their water resistant jackets will have you looking stylish while keeping warm and dry. Sweats – With the selection of sweats offered at Roots and Bench, comfort has never looked so good! Pair a Roots sweatshirt with both sweatpants and shorts for a cozy look no matter how chilly or warm it is outside. Waterproof Footwear – With brands like Bogs, Wanderlust, Kamik and Timberland; Tootsies Shoe Market offers a variety of options for keeping your feet dry during April showers. Don’t forget to visit the Customer Service office for exclusive coupons while you’re shopping for your new spring items! Follow us on social media and check our promotions page for current deals. Tootsies – Bogs Sweat Pea slip. Puma – Men’s Enzo running shoes in black. Columbia – Men’s Timber Pointe II jacket. Puma – Women’s Modern Sport jacket in aqua. Puma – Men’s Ace Windbreaker jacket in black/white. Roots – Women’s Salt and Pepper hoodie. Puma – Women’s Last Lap metallic jacket in aqua. Puma – Women’s Radiate XT Cosmic running shoes in aqua/silver. Roots – Men’s Salt and Pepper hoodie with zipper. Tootsies – Women’s Kamik rain boots. Roots – Women’s Salt and Pepper sweat shorts. Columbia – Women’s Access Point II jacket. Puma – Men’s Energy Blaster jacket in black. Tootsies – Wanderlust Weather or Not shoes. Timberland – Chillberg waterproof hiking boot. Timberland – Mt Maddsen waterproof hiking boot.